Which do you think is worse: sudden, excruciating discomfort that’s gone after a short while, or less intense but steady, stubborn pain that constantly lingers? While “no pain” is always the preferred choice, some people do live every day in chronic, lingering pain that interrupts their lives. Nerve pain, especially in the ball of the foot or in the heel, is like that—a stubborn discomfort that can limit your independence and mobility. However, there is relief for your pain with NeuroTherm®. 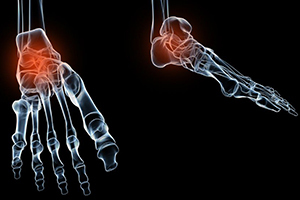 Nerve pain in the feet and ankles is unfortunately common. It can be related to a number of different conditions and concerns, from neuropathy and neuromas to chronic plantar fasciitis. Discomfort from misfiring or overactive nerves can create burning, tingling, numbness, and sharp pains after sleeping or spending an extended period of time sitting. You can feel it in your arches, heels, or even the toes and balls of the feet, depending on specific tissue damage and the nerves that are being affected. Many conservative treatments can be successful in removing pressure from the damaged area and reducing the uncomfortable symptoms, but some pain is more stubborn. When regular, noninvasive cures are not enough, more advanced and minimally invasive procedures are the next step. Dallas Podiatry Works is dedicated to providing the best care to all of our patients, who shouldn’t have to suffer from uncomfortable lower limbs, nerve pain or not. The NeuroTherm® radiofrequency generator is on the cutting edge of technology for dealing with strong or resistant pain. It’s used for a procedure called radiofrequency nerve ablation, which disrupts the signals from selected nerves in your feet, relieving your discomfort. This is an FDA approved treatment and allows you to return to your activities also immediately, though you may feel somewhat sore for a little while following the procedure. If you have been diagnosed with a neuroma, plantar fasciitis, or other uncomfortable, nerve-related conditions that are not healing using regular conservative treatments, the NeuroTherm® therapy may be your best option. When you come in for this minimally invasive, nonsurgical procedure, your foot will be prepped for the radiofrequency nerve ablation. The doctors may choose to reconfirm the location of the problematic tissue to be sure the treatment is accurately administered. They will then place the RF cannula and confirm that it is in the correct spot in your foot. They will carefully anesthetize the nerve with a needle, then thread an electrode through the cannula. The electrode will interfere with the nerve’s signals to the brain, relieving your discomfort. Then everything is removed and you are sent home, able to return to your regular activities. You don’t have to live with and suffer through your nerve pain. The problem does tend to get worse the longer you ignore it and can severely limit your mobility and freedom if you let it. You do have options for remedies, however. The NeuroTherm® treatment can make a significant difference in eliminating your stubborn nerve discomfort. Contact Dallas Podiatry Works for an appointment or more information and take care of your feet before they feel worse. Visit the contact page online or call either of our two offices to reach us: (972) 566-7474 for the Dallas location, or (972) 943-3323 for the Plano office.